Detox away the winter blues and get ready for spring! Start with a back exfoliation to clear away dry skin and allow for the ultimate toxin release. Lie back onto warm, detoxifying bubbling mud while your feet receive an exfoliation and toxin clearing foot massage. The final step in this detox is a 25 min back massage with juniper oil. This treatment is sure to leave you with a little more spring in your step! Hello Sunshine! It’s time for some skin love! We begin this treatment with a citrus exfoliation. 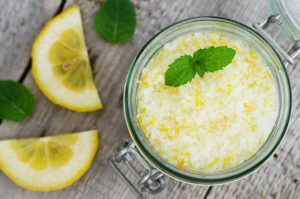 Citrus fruits naturally exfoliate the skin without harsh chemicals. We are pairing this with our green tea mask to add the power of antioxidants to help fight against aging. Healthy glowing skin is just a facial away!